1-2 A Registrar of the Imperial Court was called at once to the side entrance of the Forbidden Gate. The Registrar filled an official post in the Ministry of Heaven and tended to various matters at the Imperial Court. A Registrar was positioned at the gate to make a record of all persons who wished entrance to the palace, to confirm their identities, and pass communiques back and forth. “But they’re wounded!” said the captain, attempting to intercede. Though Toshin and the other soldiers at the Forbidden Gate were members of the Palace Guard, they were “on loan” to the Registrar. Technically speaking, they were attached to the Ministry of Summer, but the chain of command at the gate went through the Registrar. She spoke in a manner that suggested she was constraining her true feelings, but the Registrar answered with only a cold, dismissive glance. He again blocked the captain’s attempts to intercede and turned his back. In that moment the woman reached out and snatched the lance out of Toshin’s grasp. No sooner had Toshin raised his voice in a shout but the woman had broken through the phalanx and ran toward the Forbidden Gate. The collective breath of surprise taken by the Registrar and Toshin and Gaishi and the other soldiers delayed their actions another second. The soldiers came back to their senses and tore after the woman in a frantic rage. Just before the tips of their lances reached her back, a black wing descended between them. Using the beast’s back as cover, the woman bowled through the side gate. “Get her!” arose a chorus of voices. Toshin surged to the front of the pack, chasing after the beast as it slipped through the side gate. Forefront on his mind was his blunder. Despite holding the sword Gaishi had entrusted to him, he had carelessly let her steal his lance. There would be hell to pay for a screw-up like that. His guilty conscience assailed his thoughts. He’d fallen for her ruse like a rube. She’d faked her wounds. Her beast’s labored breathing must have been a well-trained act, the business about her being a Tai general a bold-faced lie. He hadn’t just fallen for her fabrications. He’d swallowed her shabby, little drama hook, line and sinker. That gave her the opening she needed. Inside the Forbidden Gate were parade grounds large enough to put a battalion through formation drills. The woman and her beast charged toward the stairs at the back of the plaza. Perhaps catching wind of the uproar, the soldiers and officers on standby spilled from the barracks adjoining the plaza. Nothing shabby about it, Toshin thought as he raced after her. He hadn’t seen her performance for what it was. The woman and the beast really had looked on the verge of death. Even if the sticky, clotted blood could be attributed to red clay, it sure looked real. Toshin fixed his eyes on the woman staggering up the steps. Even now her right arm hung limply at her side. Right before his eyes she fell over. Again, her right arm didn’t move. The beast galloped over and tried to help her up. When she grabbed hold of its neck, it was with the same hand holding the lance. Toshin nodded and set off in pursuit of the woman. Clinging to the beast’s back, with one final burst of effort, she attempted to reach the highest level of the plaza. No, thought Toshin. If they opened the gate without being fully appraised of what was going on, the woman would try to slip through to the inner palace. In the very moment these concerns occurred to him, the side gate budged. Perched on the beast’s back, the woman made a beeline for the side gate and barreled through to the inner palace. Cries of dismay arose around him. Calls of shock and censure from above him. These sounds ringing in his ears, Toshin bolted up the steps and reached the side gate. At the same time, the beast’s scream hit Toshin like a fist to the solar plexus. The soldiers on the other side of the gate must have finished them off. Feeling like he’d swallowed a bucket of lead, Toshin stumbled through the side gate. Inside was the Roshin, the vestibule leading to the inner quarters of the Imperial residence. Partitioning the spacious balcony was a high barrier wall, beyond which soared the edifices of the Seishin, the empress’s personal domain. These areas of the palace were off-limits to most of the high officials of the Kingdom, not to mention Toshin and his fellow soldiers. The beast had collapsed on the cobblestone path leading to the Seishin. Many barbed grappling hooks had been flung across its body to restrain it. “No! Don’t kill it!” came Gaishi’s voice. The soldiers surrounded the beast looked around in surprise. 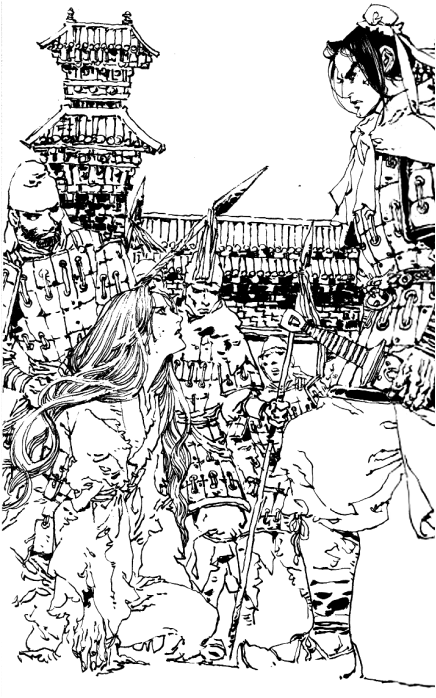 As Toshin came adjacent the encircling cordon of soldiers, one was thrusting the tip of his lance against her neck. He yanked it out at once. The woman’s body convulsed. Angry epithets arose from the cordon of soldiers. The shrill, foul-tempered voice of the Registrar rang out from the gate. “Kill her!” he screamed. Commands to kill and not to kill—the woman and her beast still attempting to flee—the cordon of agitated soldiers pressing in on them—in the height of the panic and confusion, a clear voice rang out. Toshin breathed a sigh of relief. The figure approaching the cordon was a big man holding a big sword in one hand. The Daiboku of the Ministry of Summer. He was attached to the security detail charged with the protection of the empress and the other court nobles. Among them, the Daiboku specifically shadowed the empress in the course of her daily routines and served as her personal bodyguard. In terms of actual social class, he never rose above that of a lower-ranked baron. But this Daiboku had the special trust of the empress. When out of the public eye, he never strayed far from her side and took command of her junior retainers. Even now the Daiboku was accompanied by three retainers. “A rebel!” the Registrar called out. “Not a visitor!” came that screeching voice. The Registrar again. “She feigned being a visitor to invade the palace!” The Registrar went on at length about the circumstances that had brought about the current state of affairs. With that the Daiboku strode toward her. Toshin threaded his way between the bewildered soldiers and stole to the woman’s side. He retrieved the lance that had fallen from her grasp and took the opportunity to examine her more closely. Not a lie. And not a staged performance. Blood indeed stained her torn, filthy clothing in its grotesque patterns, taking on the color of iron as it clotted and dried. The remnants of the leather armor barely hung on her body and her right arm lying against the stones was bound tightly with a cord. Beneath her torn sleeves her forearm was withered and black. Necrosis was setting in. She wasn’t human. If she hadn’t been a wizard she’d be dead by now. The woman bowed her head as if to thank him. Groaning, she righted herself and turned to face the Daiboku. The Registrar was still shrieking at them but the Daiboku ignored him and knelt down on the cobblestones. Toshin nodded and put his hand on Risai’s shoulder with the intent of helping her to her feet. She gently brushed it away. Risai shook her head and attempted to pursue Koshou, who was already leaving at a brisk walk. She clung to him as if clutching at her last straws. Toshin gulped. Risai’s face was white from loss of blood. Her lips were turning blue. She struggled for each breath, the air wheezing weakly in and out of her lungs. Her shoulders and arms were growing cold. Perhaps implicitly understanding the press of time and seeing the look of desperation on her face, Koshou nodded. He handed his sword to one of the retainers, reached out, and took the woman in his arms.